Get thee to a Target--these nail brushes were in the cheapo bins right at the front of the store! A nailbrush is one of the essential tools for Montessori Hand Washing. Cuteness is for extra credit. If you have toddlers yourself or take care of one on a regular basis, you know that using the potty and hand washing happen ALL DAY LONG. 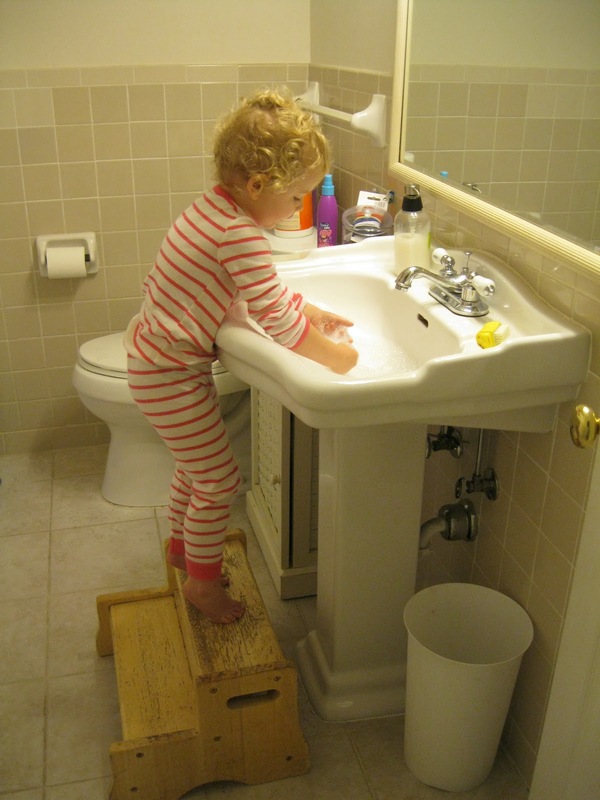 Make sure you have things set up so that your little one can wash his or her hands thoroughly, with very little help from you. 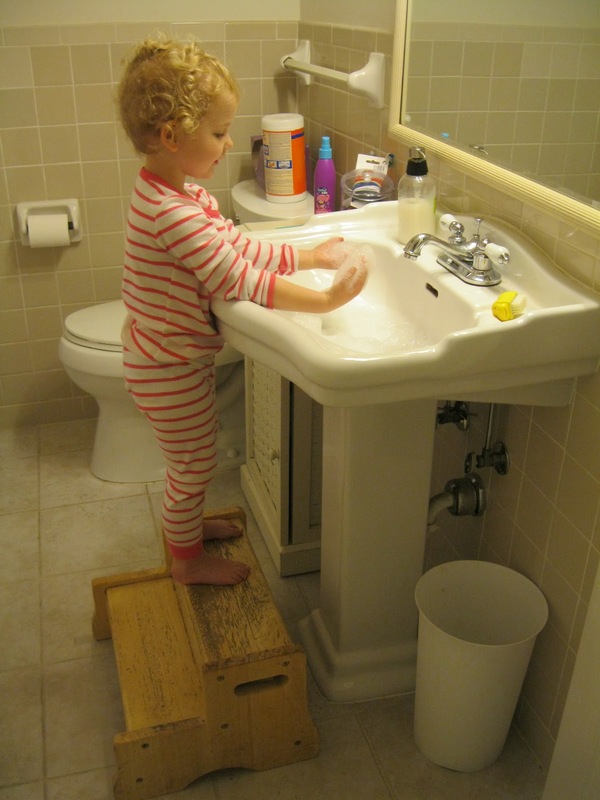 Last summer, when Alleluia was learning to use the potty, I wanted her to be able to wash her hands without me hoisting her up each time. In my Montessori training we were shown how to teach hand washing at a station with a low table, a bowl, a pitcher with water, soap, etc. I wanted to adapt the lesson to use our bathroom sink, so I made sure she had a heavy, tall step stool in front of our sink, some soap, a towel nearby and--of course--a cute nailbrush. We fill up the sink with water (about two-thirds full) and try to make as many bubbles as possible, rubbing our soap-laden hands together under the running water. (I think early on Alleluia convinced herself that Mr. Sink liked to eat bubbles--the more, the better.) This is a great opportunity to have your toddler practice singing either the "A, B, C" song or the Montessori version, which replaces the letter names with letter sounds. It's exciting when we drain the sink, because sometimes Mr. Sink makes a loud growling noise that's slightly scary! 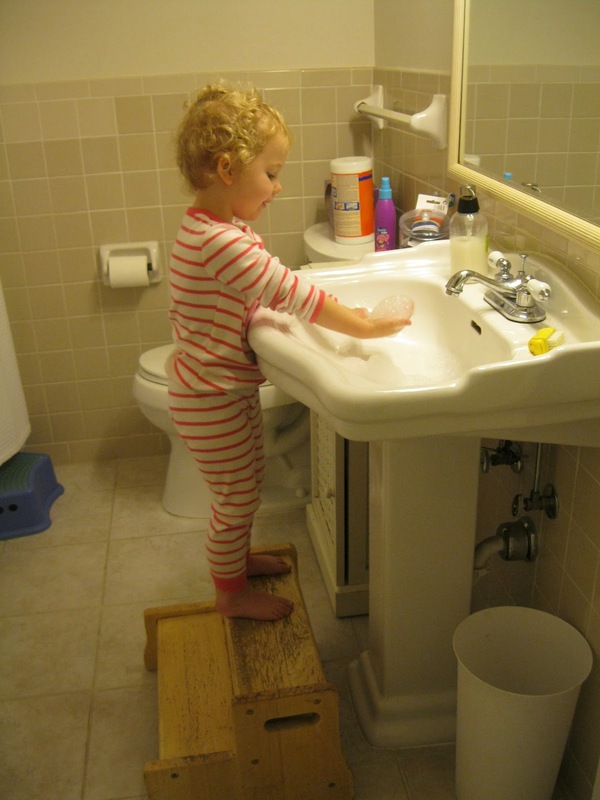 When we remember that practical exercises such as washing hands are an important Montessori work, they don't seem like such a chore, do they? Most children actually enjoy playing with bubbles and with water, so making more of an event out of something they must do regularly makes sense!